your people may always find joy. Our catechesis today deals with Saint Robert Bellarmine, the great Jesuit theologian and Doctor of the Church. In the period following the Council of Trent, Saint Robert taught theology, first at Louvain and then in the Roman College. His most famous work, the Controversiae, sought to address the issues raised by Protestant theology from a serene historical and theological perspective, while his most popular work remained his brief catechism of Christian doctrine. He also served as spiritual father to the Jesuit students of the Roman College, including Saint Aloysius Gonzaga. 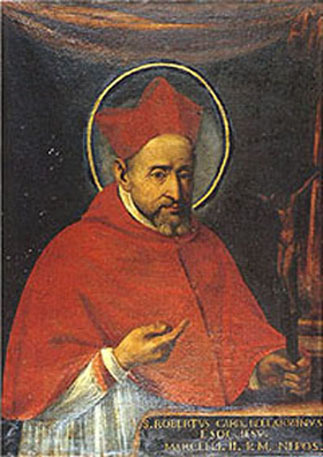 Saint Robert was created Cardinal by Pope Clement VIII, and made Archbishop of Capua, where he spent three years in preaching and pastoral activity before being recalled to Rome and the service of the Holy See. In his later years, he composed a number of works of spirituality which reflect his deep Ignatian formation, with its stress on meditation on the mysteries of Christ and the loving imitation of the Lord. May the example of Saint Robert Bellarmine inspire us to integrate our work and our pursuit of Christian holiness, to grow in closeness to God through prayer, and to contribute to the Church’s renewal through our own inner conversion to the Lord and the truth of his word.